I needed grace this week. I need it always I suppose, the need is just more evident at some times than others. And God’s grace picked me up and carried me through another week of homeschooling. Perhaps someone prayed, I know I did. I had been reading of Moses, and was envying him, not because of his oh-so-difficult-job but because it seemed so simple for him to just ‘cry out to the Lord’ for help and then hear some specific instruction from Him. Like the time the Israelites are all cornered at the Red Sea and God says: ‘Lift up your staff; stretch out your hand.’ (Ex.14) and voila, the sea parts. The contingencies keep coming. Moses keeps calling out for help. God keeps instructing him in what to do. I felt a little envious of Moses, (though I think I’m changing my mind, having taken a second look at the miserable job he had!) because it seems God answered him so clearly, with such specific instructions. And I was wishing I would get such detailed lesson plans. Then I had to wonder, is it that God’s not instructing? Or that I’m not listening well? I read somewhere once that the prerequisite for hearing from God, is a heart ready to do whatever He says. Moses was known as the meekest man that ever lived for a reason. He was ready and listening for every drop of counsel God would give, glad to comply! But in retrospect, though I did not get an audible response to my pleas for guidance—little germs of wisdom did begin to gel in my mind. Insights, ideas, new ways of doing things presented themselves. And fresh determination and renewed hope seemed to spring up overnight. I didn’t have to raise a staff, or toss a tree, or strike a rock but grace did flow and it was enough for one more week in our journey. God’s manifold grace was evident. The stories of the children of Israel illustrate this so well. There they were on the verge of entering the Land of Canaan at last—the spies go in and find it ‘’an exceedingly good land” (Numb.14:7ff) Joshua and Caleb try to persuade the people that “if the Lord delights in us, He will bring us into this land and give it to us…” But all the other spies can talk about are the giants and the insurmountable difficulties they will have to face. They fail to obtain the grace of God. This grace is contingent on faith in God’s ability, not our own. It requires confidence that what we are too weak to tackle, He is well able to take care of. Wow (again). A pertinent object lesson for me. I am so grateful for grace, the grace I’ve been shown this week, the multi-faceted graces of God scattered through all my days. As we receive God’s grace, we become stewards of it to others “…as good stewards of the manifold grace of God.” (I Pet.4:10) This concept was brought home to me this week in the reading of Joni’s memoir: The God I Love, her story of a lifetime of walking with Jesus through a degree of disappointment, suffering and loss few of us will ever know. It is a joyful testimony to God’s incredible grace as she embraced her lot (quadriplegia) and found God to be more real than she had ever imagined. It is God’s story of using Joni in her weakness to encourage innumerable others and to offer a perspective of eternity not easily come by in times of health and plenty. Her story, her faithfulness to walk with Jesus in joy, is a gift of God’s grace that extends to me. Being one who fears suffering, I admire Job, who wouldn’t? Even Satan knew he was an amazing tribute to the grace of God—in the loss of everything but life itself he submitted to God his rights: The Lord gives and He takes away. Blessed be the name of the Lord. (Job 1:21) What does any of us possess that is not a gift anyway? When did it become an inalienable right? It occurs to me that noone likes suffering, anymore than our kids enjoyed being disciplined. But we do fall down and scrape our knees. Bad dogs do bite. Pets do die, and people too. And we do get spankings. As children of God, we will suffer for one reason or another. But by faith, I can hear such testimonies and know that there will be grace, because we will never lose Jesus. The testimonies of ones who have walked with God and found Him good, these too are God’s gifts of grace to us–whether a beautifully penned memoir, or Christ-exalting lyrics, or the tinkling of fingers on a keyboard… Whether a smile or a FB note or a warm hug, all are gifts of God’s grace– the wonderful manifold grace of God dished out by His stewards, tokens of His delight in His children. If you enjoyed Gregg Howlett at the piano, consider No More Night, a spine tingling reminder of the good land yet to come! For my review of Joni’s THE GOD I LOVE, go here. You’d think that now, nearing the end of this phase of my career, I would see things differently…but I am also a homeschooling mother, and the finishing of highschool has never been easy. There is no formula. Each child is different. How is one ever ‘finished’ and ‘ready’ to be released into life on their own—in the big wide world where there is no mother at hand to come to the rescue…How does one really prepare a child for that? And if it’s done poorly, whose fault is it? And who will suffer? Never were these words so poignant as they are this week sounding in my ears: “Unless the Lord builds the house, they labor in vain who build it.” Ps.127:1 Unless the Lord is involved in the construction, it’s wood, hay and stubble that will burn, not a lasting product. (I Cor.3:13,14) It’s a waste of time and energy, in other words. What matters is what the Lord empowers, what He does in and through us, what He builds in us. Maybe that’s the main thing any of us do as parents—we gather the stuff for the building of the next generation. We point them to the Chief Architect and urge them to love the Lord their God with all their hearts and always to consult Him in everything. Maybe that’s all this crisis is about for me—a reminder that the Lord is the One with the blueprint and only He can complete this work He’s laid out for me to participate it. Who would Moses have been without this assignment that left him so constantly in need of wisdom and desperate for intervention? Would he have resorted to the Tent of Meeting so often—meeting with God as with a best Confidant so that his face shown in the afterglow? Would he have been so intent on knowing God and having Him near, always? And would he have experienced the glory of God—his mercy and grace, His slowness to anger, His steadfast love and faithfulness… (Ex.33:18ff) had he not been given this assignment to shepherd God’s children? My own heart is calmed and softened as I ponder these things. I am turned back to gratitude for this trust I have been given of shepherding some of God’s own children. For I too am thereby made dependent on God’s mercies and compelled to know Him more and so reflect His glory. I too am dependent on the One who is all that I am not, and though I stand here nonplussed and barefoot, it is, after all, a very good place to be. I dived into G.K. Chesterton earlier this week, never mind that there are dozens of books on my priority shelf waiting, barely waded in to…No, instead I tried something new, an online audio book. And while I listened I looked at an online print version, and cutandpasted thought-provoking morsels to chew on later. Chesterton churns out a lot of these. He was a man characterized by indomitable joy from what I’ve read, along with a brilliant mind and a charming wit. So I decided to try The Man Who Was Thursday: a Nightmare. * Peculiar title, I know, but fitting; the chief characters each had code names after the days of the week. The genre of ‘metaphysical thriller’ did little to pique my interest. What does ‘metaphysical’ mean anyway? (I now have turned to Wikipedia and sort of get it) And I’m really not into thrillers, but I do admire Chesterton’s genius and optimistic outlook, and the book was recommended by a friend, so… I tried it. I think I might not have persevered without the excellent rendering, complete with wonderful accents, at LibriVox. [Don’t miss this terrific free resource if you enjoy an audio book!] It was definitely not a story to fall asleep to, or even doodle idly to. Once I’d realized this and took it seriously enough to start at the beginning a second time, (with notebook at hand) the chapters started flying—suspenseful and strange, surreal and outrageous, full of intriguing symbolism. Well, I don’t want to give the whole story away. Suffice it to say the story, in retrospect, is all wound around with God superintending the affairs of man, God who appoints all things (and people) to accomplish His purposes, and ultimately wishes to be known. And scattered all along the way to keep me from getting too serious in sleuthing out the story’s hidden meaning were gems of dry wit that tickled my elusive funny bone! Are we too not in possession of such Good News? Pessimism be vanquished! God is in control. His redemptive purposes will be accomplished in and through and despite the evil and heartache which surrounds us. Though we be called to suffer, though we may long to understand what’s going on when things just don’t make sense…God knows and ordains all things for our good, for He is not only supremely powerful, He is supremely good, no matter what the enemy of our souls may say! And that has been the storyline undergirding my thoughts this week—as I wrestle for answers to perplexing problems, as I live day to day on the manna He does supply, and as I revel with thankful heart in His plentiful blessings… In all these things God is superintending and sufficient. In all these things, whether obvious or hidden, God is good. Two passages come to mind that affirm Chesterton’s storyline and with these I’ll stop, not having intended a book review today but glad for the chance to re-affirm God’s steady goodness towards the likes of us. Oh and never mind stopping there, may as well keep going and read the whole of Romans 8, very good news indeed! 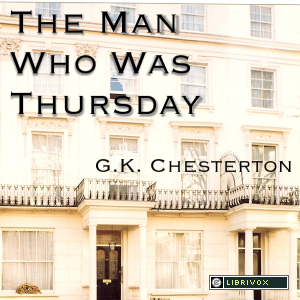 *Full audio version of The Man Who Was Thursday available here. Online print version, available here. I have peace and contentment too, almost…only this nagging thought: Is the source of my contentment Jesus, or is it all these good things He’s ravished me with? And how would I do with all the props knocked out? “When all around my soul gives way, He then is all my hope and stay” the old hymn goes. Do people still sing such things? Will I in the event of such loss? I don’t consider myself a gross narcissist but I do enjoy my pain-free comfortable life…and I do enjoy chocolate….and I do fear pain and loss. Is my contentment truly based in knowing Christ? Or is it in good things I possess and pleasant circumstances? How can I know? What am I leaning on anyway? Do I really lean on God for everything? Am I leaning so hard that if He were to fail me, I would topple over helpless? Or am I counting on my own understanding, my own resources, my own ability to back me up? I still don’t have all the answers to all the questions my ponderings have generated. But somehow, it matters most that they have been raised and turned to the One who does know. I may not know how I will fare in trauma but I can choose by faith to trust and give thanks in everything, starting now, in plenty. Paul said “In any and every circumstance, I have learned the secret of facing plenty and hunger, abundance and need.” Phil.4:12 The same Christ Jesus who gave him that kind of strength is my helper. I don’t need to develop a self-defense plan but to rejoice in the Plan that is already in place! So somehow I’ve come full circle. There it is, learning to rejoice in the Lord, for this is what the world needs most to see in the Church—real joy! May it be so. *Sorrowful Yet Always Rejoicing by John Piper is a 45 min. message available in audio form here. **”When God Ruins Us”, also by John Piper, is a short audio clip available here.